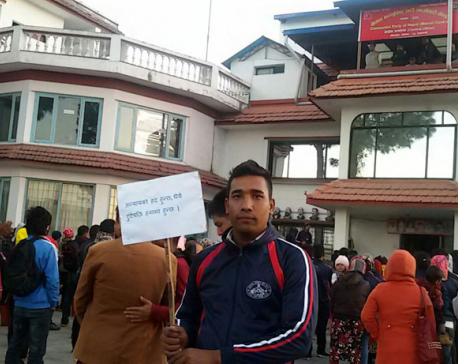 KATHMANDU, April 2: The plan of CPN-UML and CPN (Maoist Center) to finalize the left merger has been thrown into disarray due to the latter's demand for 50 percent stake in the unified party. One and half months after signing a seven-point framework agreement to merge with UML, CPN (Maoist Center) Chairman Pushpa Kamal Dahal last week demanded "equal and dignified status" in the unified party. The call for 50 percent share in the unified party came as "an unexpected twist" in the political marriage of the two left parties which were in the last stage of negotiation to draft joint documents relating to political, organizational and ideological aspects of the new party. Dahal, according to his aides, raised the issue of equal and dignified division of power after UML offered to give the Maoist Center 30 percent stake in the new party, going against its own erstwhile commitment to offer 40 stake in the party organization. They said that Dahal's remarks followed Prime Minister KP Oli's offer to integrate the two parties in 70:30 ratio. 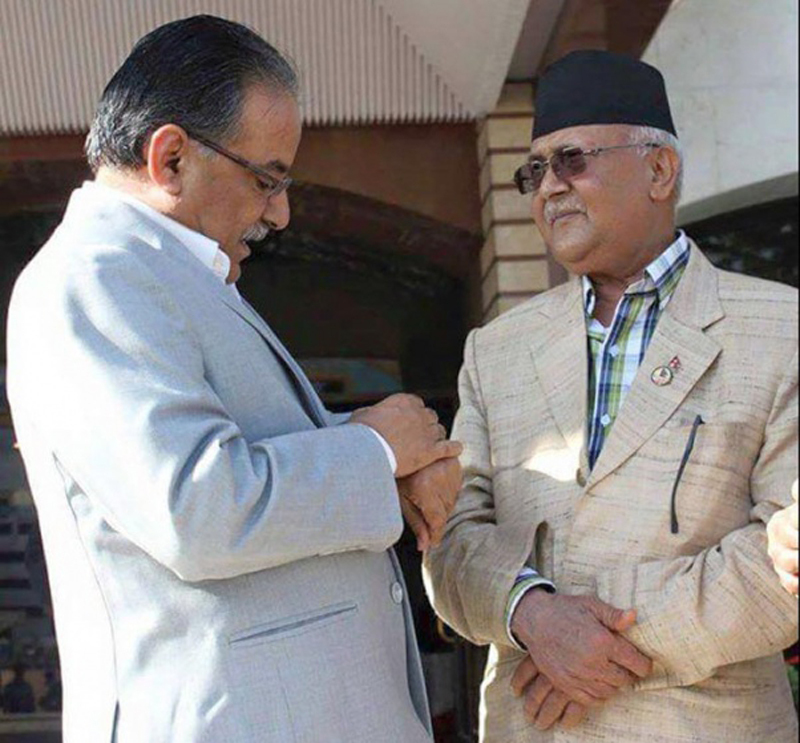 Leaders said Dahal's demand for equal share is an effort to maintain his grip in the party after the unification. Dahal, who will share the party's helm with Oli until the first general convention, will not only risk losing control of the party but won't be able to split the party when needed if he accepts 30 percent stake in the new party. The shift in Dahal's stance has put doubt on whether the unification would be held by April 22, the self-imposed deadline of the two parties to wrap up the merger. Two taskforces formed to sort out ideological and organizational differences have already drafted the proposed party statute and outlined the modality to unite the organizational structure of the two parties. But some key issues including division of power, election symbol and the Maoists' demand for formal recognition of People's War in party statute remain to be settled. "These are surely serious differences but these can be addressed if leaders from both the parties show sincerity and maturity. Both sides should compromise since we have already come too far to abort this process,” Maoist Center spokesperson Pampha Bhusal said. A taskforce headed by UML senior leader Madhav Kumar Nepal has prepared a 41-page document, while another taskforce led by Maoist leader Ram Bahadur Thapa has drafted statute containing 76 articles. Bhusal said that the unification would conclude as soon as the remaining issues are settled. She said that the taskforces have already sorted out more than 80 percent of works pertaining to various aspects of the merger. On organizational front, the to be unified party--which has been named Communist Party of Nepal--- will have eight executive committees consisting of the convention committee, national council, central committee, provincial committee, district committee, election area committee, local level committee, ward committee, and poll booth committee, according to UML leader Baburam Bhusal, who was involved in drafting the statute. The central committee will act as the party's steering committee with two strong bodies-- the politburo and the standing committee -- under its purview. The central committee will not have more than 299 members, while the politburo and standing committees will comprise of around 99 and 33 members respectively. The number could go up or down depending on the need. The taskforce has proposed setting up 150-member provincial committee and 75 to 125-member district committee, while election area and local level/municipal committees would each comprise of 75 members, informed leaders involved in drafting the party documents.